Titanium Dioxide (1.5%), Zinc Oxide (17%), ProVention-RÃ¢âÂ¢ Complex (Green Tea Extract, Cranberry Fruit Extract, and Pomegranate Extract), Vitamin C.
Having really oily skin, I have found it really hard to find a sunscreen that doesn't make my skin shiny and greasy. I can't begin to tell you how many brands I have bought and tried without success. I really like Dr. Murad's oil control mattifier spf 15, BUT, for some reason, it makes my eyes sting and burn about 5 hours after putting it on. I also wanted a sunscreen with a higher spf. I was looking around online for something that would work for my problem skin and sensitive eyes and I came across MD Solar Science mineral creme spf 30 and spf 50. I read all the reviews from different websites that I could find and I decided I would try the spf 50 version. I absolutely FELL IN LOVE with this sunscreen! It doesn't sting my eyes, it dries to a matte finish when I put it on and my skin at the end of the day had a beautiful dewy look-NOT GREASY! It also does NOT cause breakouts! My only complaint is the $30.00 cost for a 1.7 oz. tube, but I love it so much I will continue to buy it. For anybody that is wondering, my skincare routine in the pm is: I wash with Neutrogena's oil free acne wash with my hands, rinse with a washcoth, pat dry, wait 5 minutes and then I put a pea sized amount of Proactiv Solution repairing lotion on my entire face. In the am: I again wash with Neutrogena's oil free acne wash with my hands, rinse with a washcloth, pat dry and follow with Skin Medica's rejuvenative toner (has NO alcohol and exfoliates my skin beautifully WITHOUT irritation). I let the toner dry completely before I apply MD Solar Sciences spf 50. I am 44 years old and this is probably the best my skin has looked since I was about 12 or 13 years old! leave your skin matte all day long! 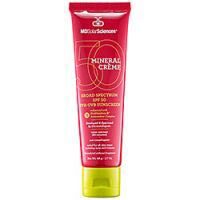 good as make up base spf +50 and not clogging pores expensive leave a white cast if use too much I tried to find a good sunblock for acne prone skin, I currently live in SF right now, before I lived in a tropical country which is hot and humid area. and I always use sunblock from my doctor there. But in the US, doctor is soooo expensive for a student like me, one day I try to do some research on sunblock for acne prone skin, and this sunscreen was always "exist" it always in the TOP list. that's why I tried to use it, however firstly I was scared because this is mineral product, and I thought that mineral is a big no-no for acne prone skin and SPF +50 will clog pores.. however when i took a sample from a beauty store, I like it. yes it will leave white cast if I use it too much, and I have to rub this cream so it won't leave white cast, but it will make my skin matte all day long, and good as a make up base. but if your skin is flaky or too dry, i won't recommend using this product without moisturizer.